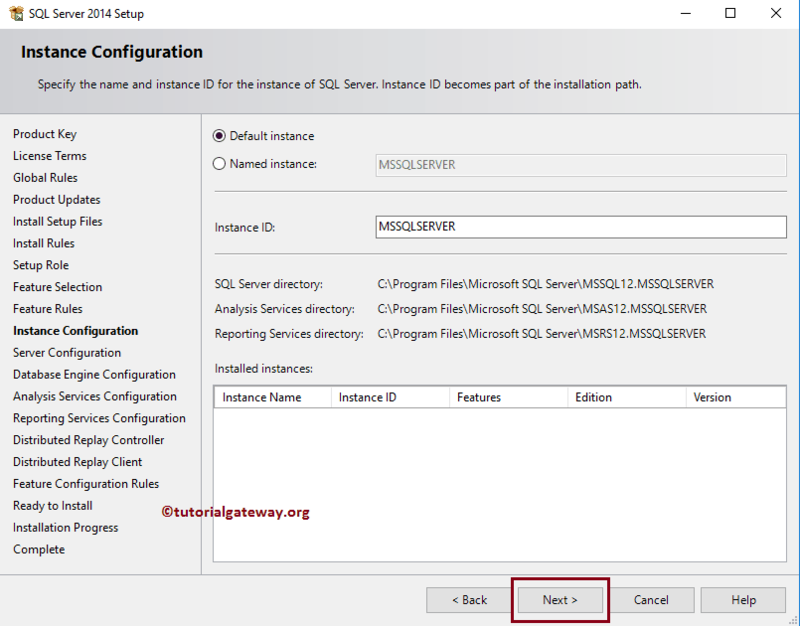 In this article, we will show you, Step by step procedure to install SQL Server (irrespective of the version) with screenshots. 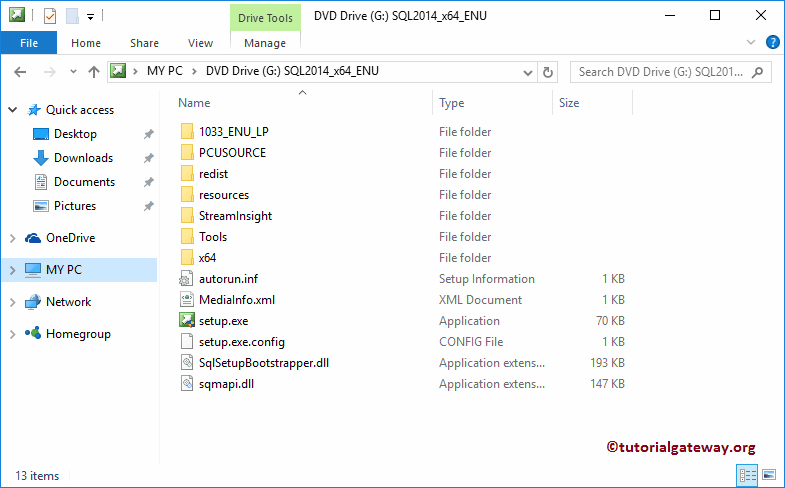 STEP 1: If you have the installation CD / DVD, then insert the installation media into the drive to install SQL Server. Within the root folder, double-click on the setup.exe as shown below. 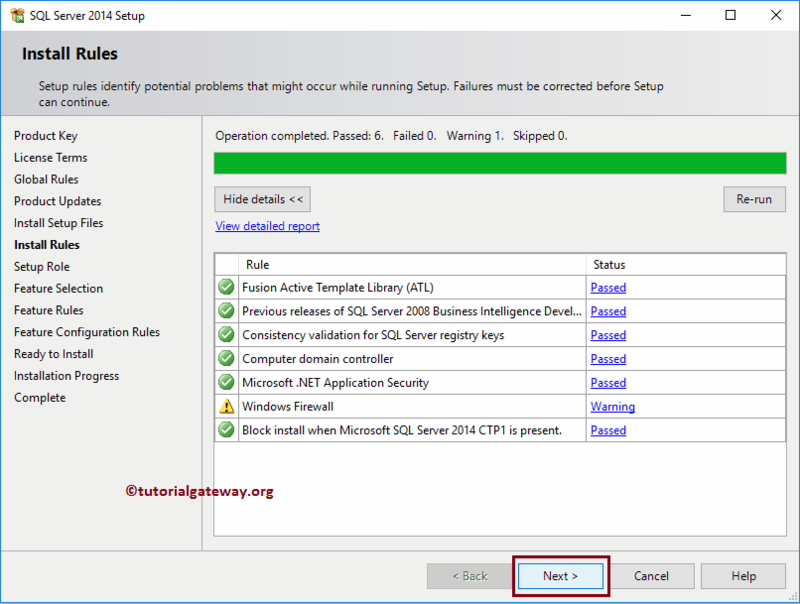 STEP 2: Once you click on the setup.exe, a new installation wizard called SQL Server Installation Center will be opened. 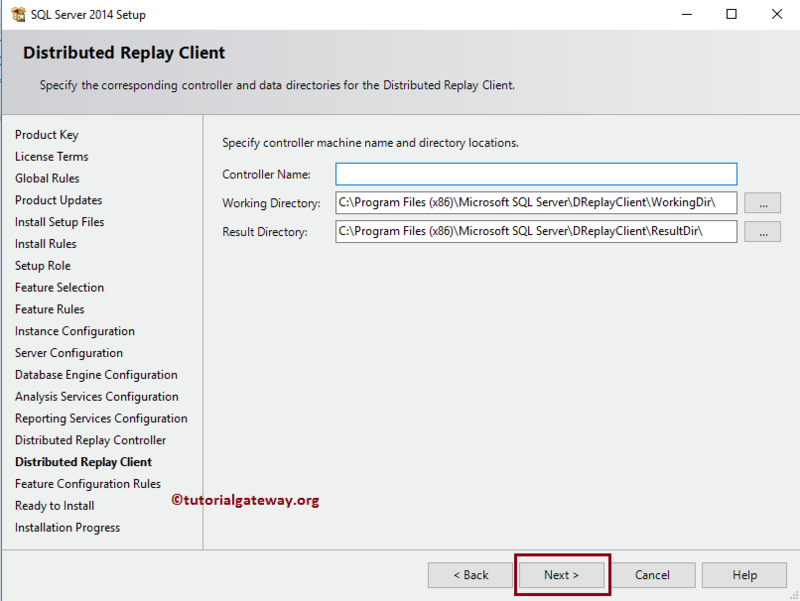 Before you start installing the software, it is always recommended to check the Hardware and Software requirements that are required to install SQL server. For this, click on the Hardware and Software Requirements hyperlink under the Planning tab. 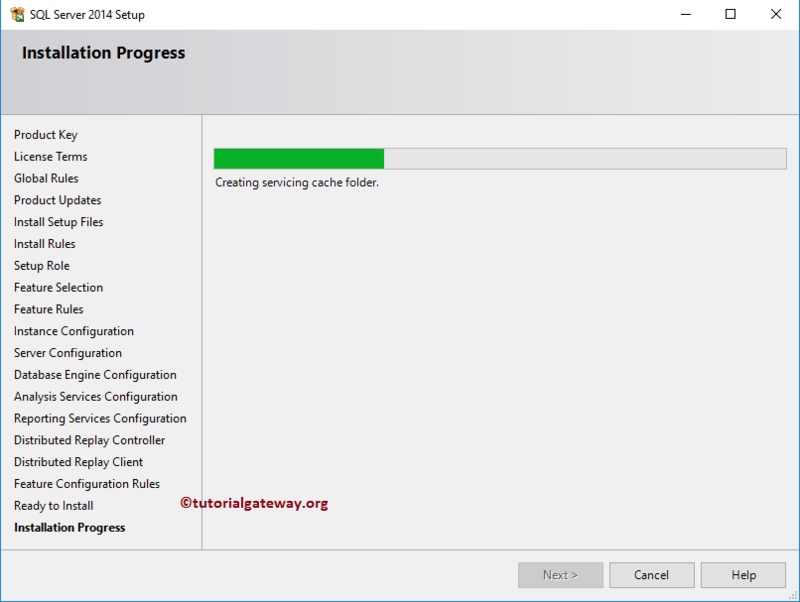 And, if you don’t have any of those pre-requested software then, you have to install them before installing Sql Server (proceeding to the next step). 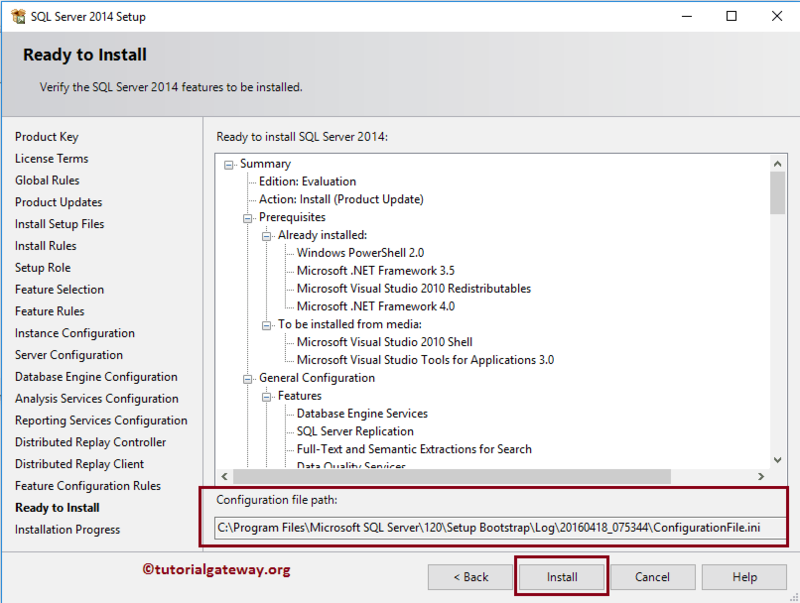 STEP 3: Next, go to Installation tab to install SQL Server. 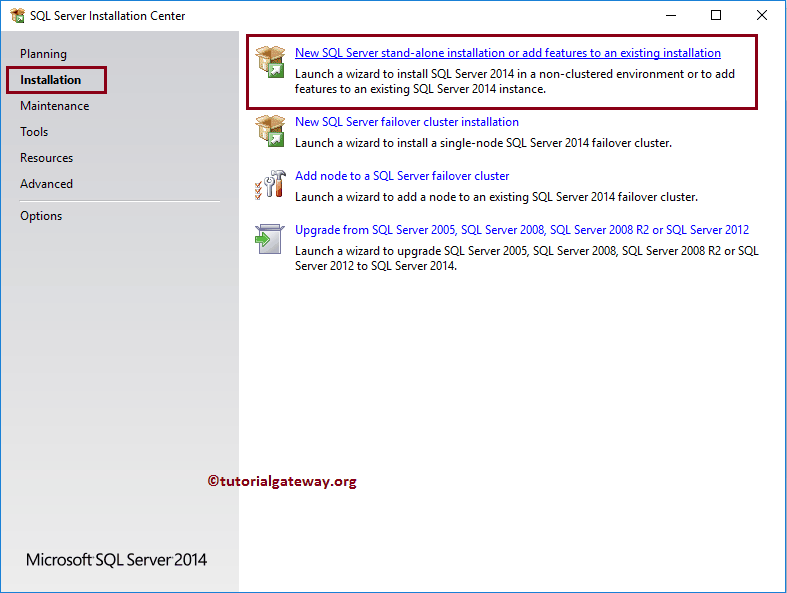 New SQL Server stand-alone installation or add features to an existing installation: If you are installing the SQL for the first time, or if you want to add additional features to the existing instance then please select this option. 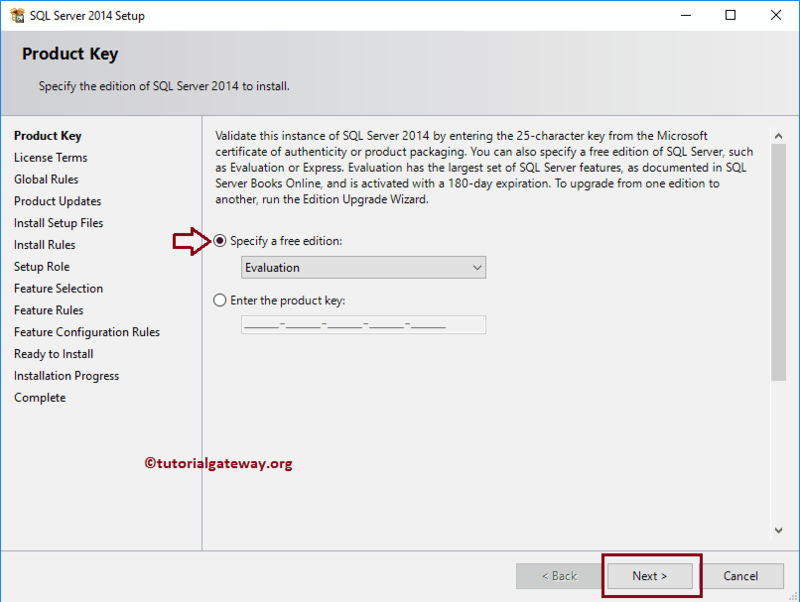 Upgrade from SQL Server 2005, SQL Server 2008, SQL Server 2008 R2 or SQL Server 2012: If you want to upgrade from the previous versions the select this option. 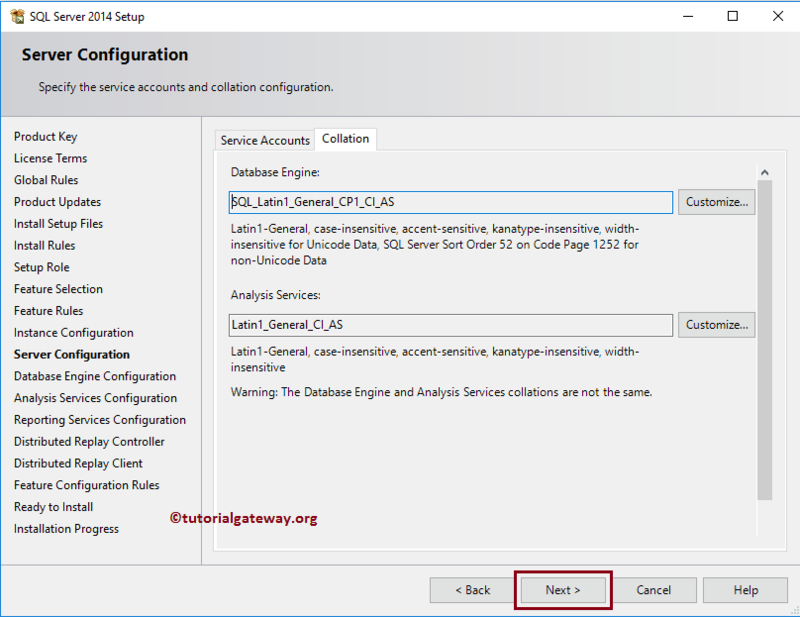 STEP 4: Once you select an Option, a new wizard called SQL Server 2014 Setup (Version might be different for you) will be opened. On the first page, you have to enter the Product Key, or you can try the Evaluation period 6 months, by selecting Specify Free edition: Evaluation as we shown below. STEP 6: Next, it will enter into Install Rules window. And here, setup will automatically advance and perform the operations. Here, it has to pass all the rules present in this windows, but you can leave this Windows Firewall warning. If you want to pass the Firewall then please disable the windows firewall from your windows settings (control panel). Analysis Services: To create Cubes, so that we can use MDX queries on this multidimensional data. Please refer SSAS page. STEP 8: Within the Feature Selection page, you have to select the components that you want to work with. 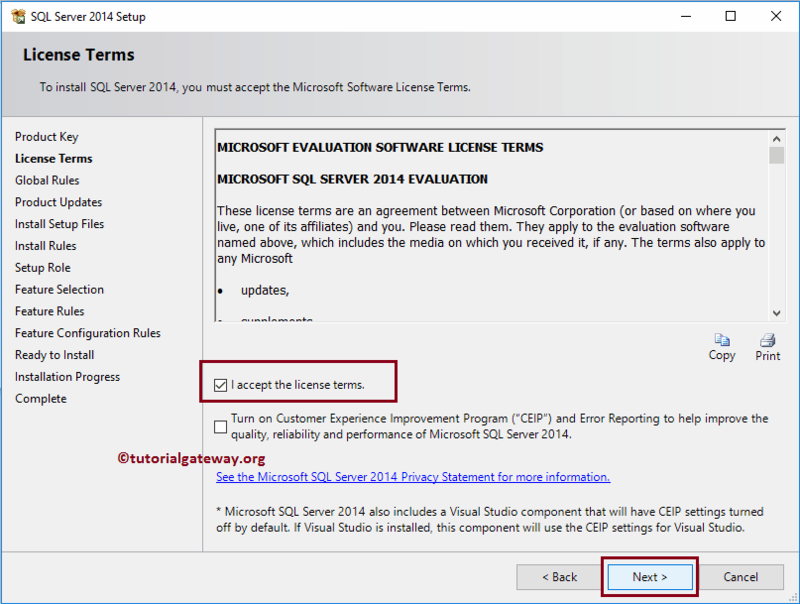 Here, we are going to use this SQL Server for our SQL, MDX, SSAS, SSRS, and SSIS tutorials. So, we are selecting all the available components. 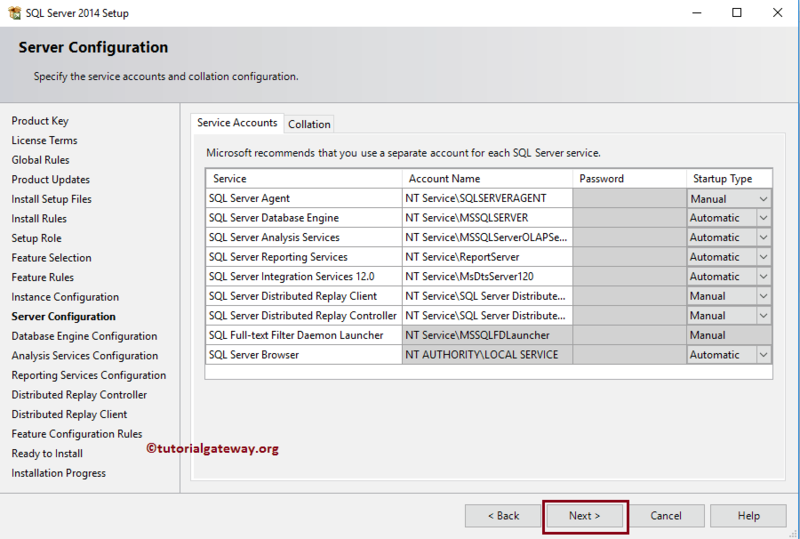 STEP 9: Once you click the Next button, it will enter into Instance Configuration page. Here you have to specify the instance name and the instance Id. 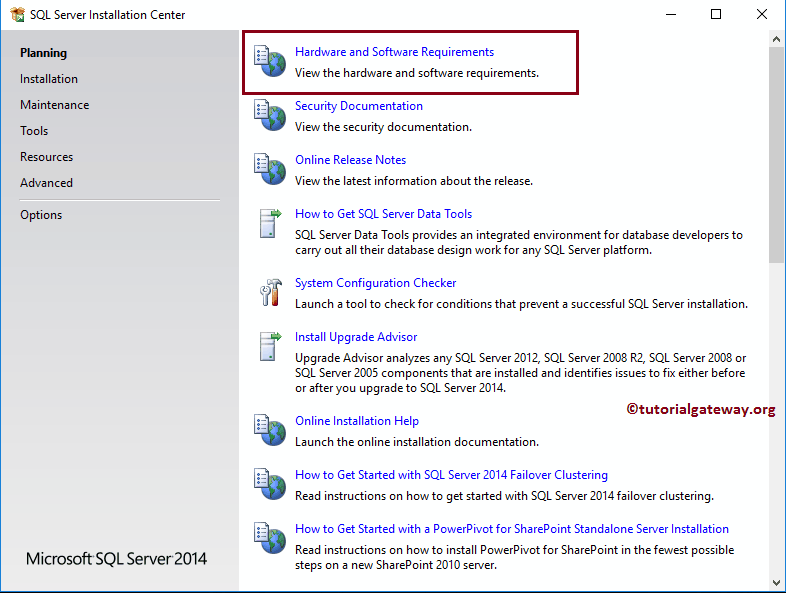 If you are upgrading the SQL Server then select the default instance so that it will Update the existing install. 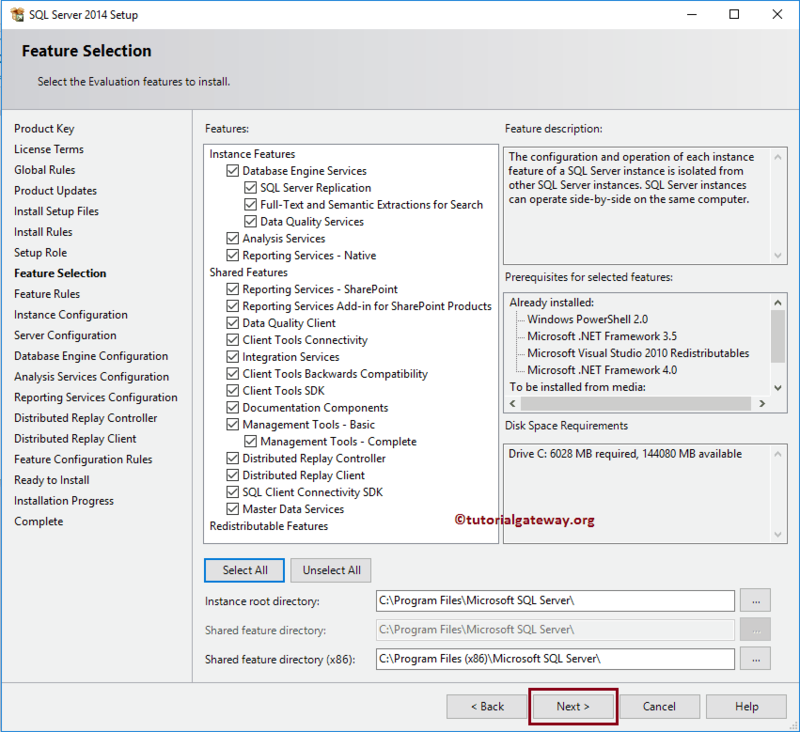 Or, if you are installing Sql Server second instance (a system already had one instance) then select the named instance, and give a unique name. 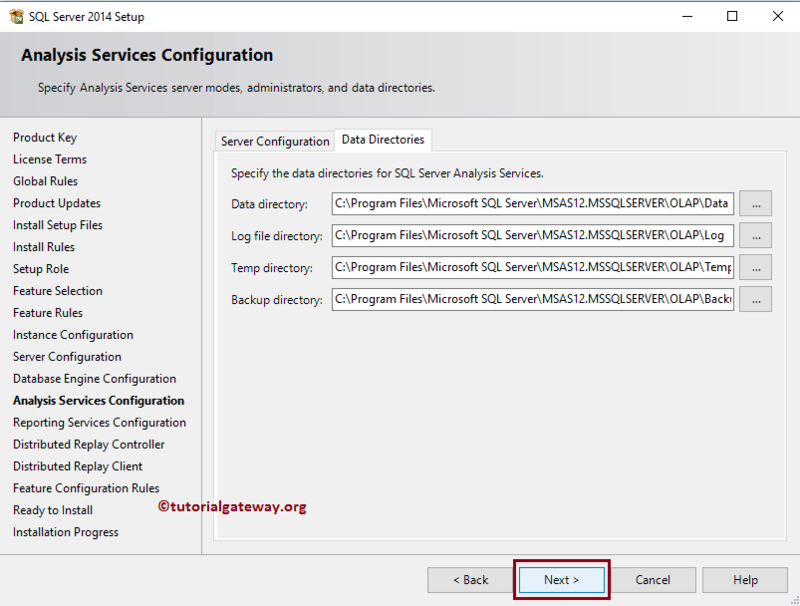 STEP 10: You can use the Service Accounts section under the Server Configuration Page to assign either local system, or a domain user account to the SQL Server services. Please change as we shown in the below screenshot. Leave the Collation section to default settings. 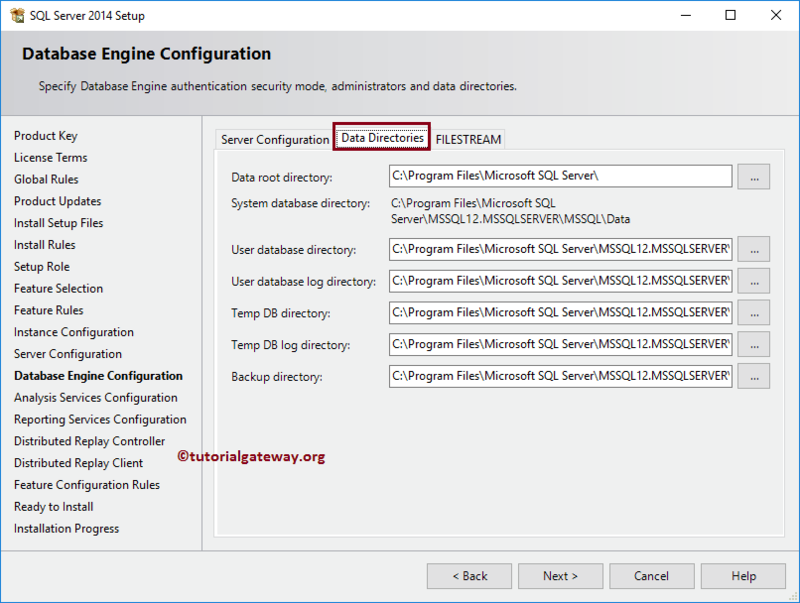 STEP 11: Once you click the Next button, it will enter into the Database Engine Configuration page. Here you have to specify the authentication mode. If you select the windows account then, step up will activate the sa account. 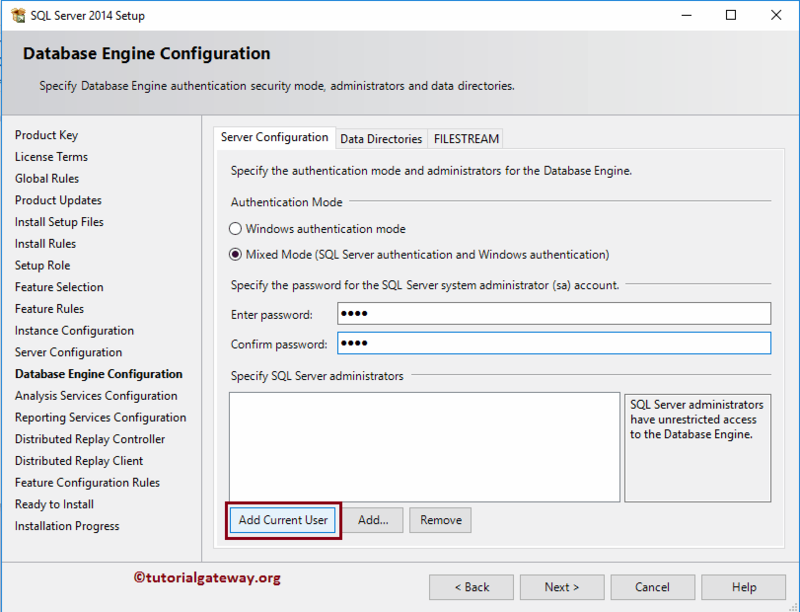 Or, if you select the Mixed Mode then you have to specify the strong password that you will be used to enter the SQL Server database engine. Next, add the Users to access the database, and here we are adding the current user. Data Directories Tab: Leave the data directories to default. 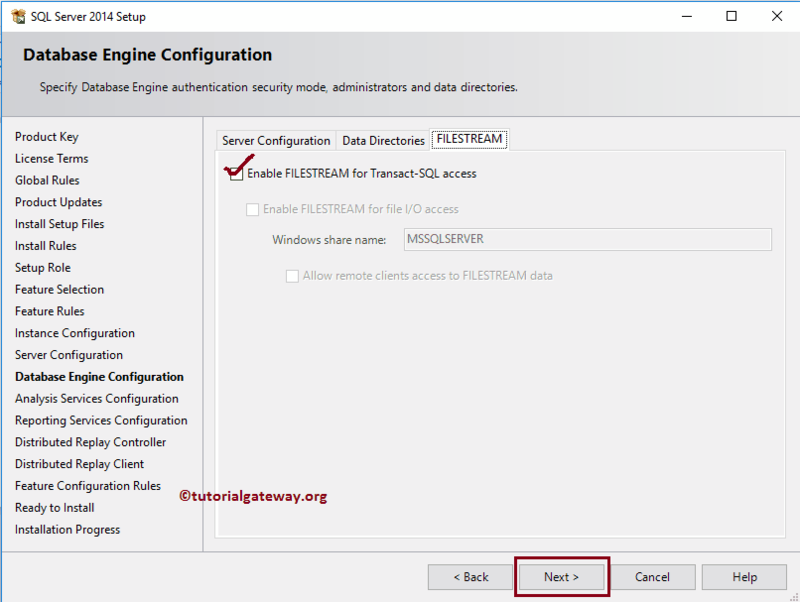 FILESTREAM Tab: Checkmark the Enable FILESTREAM for Transact-SQL access. 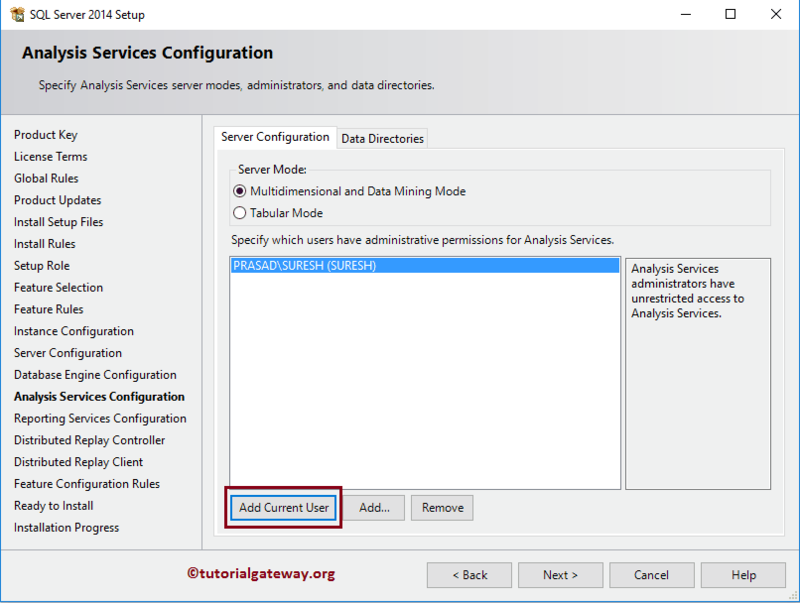 STEP 12: Once you click the Next button, it will enter into Analysis Services Configuration page. Here you have to configure the Server, users to access the analysis services. Please select the Multidimensional and Data Mining Mode, and add the current user by clicking the Add Current User button. NOTE: Use the Add.. button to add users to the service, and Remove button to remove the added users. 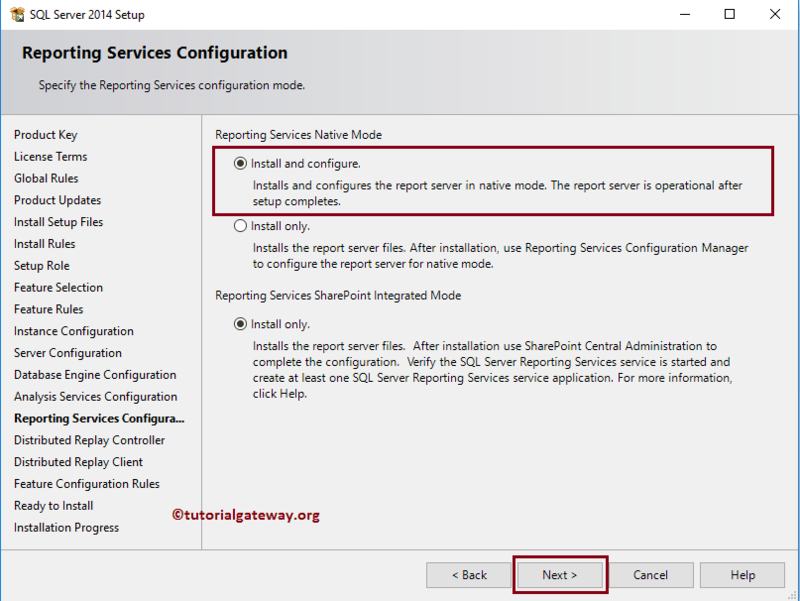 STEP 13: Once you click the Next button, it will enter into Reporting Services Configuration page. 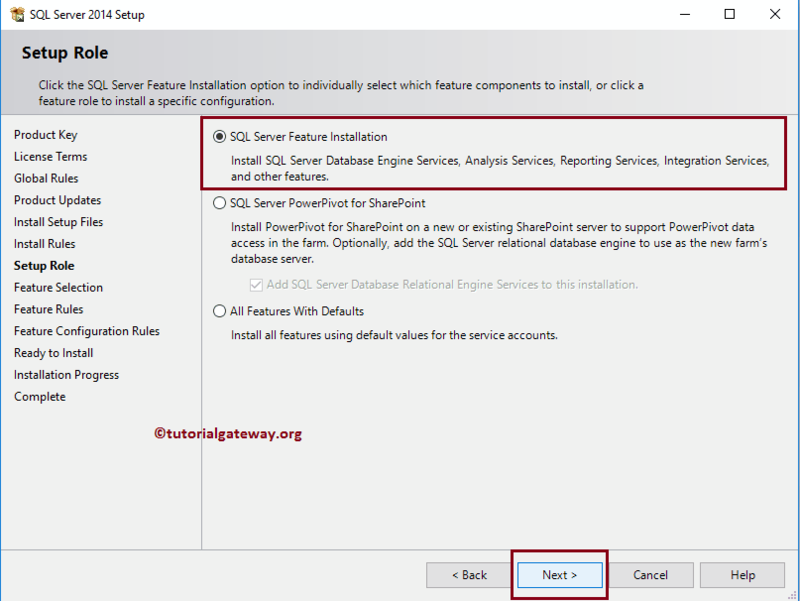 Please select the Install and Configure option to install Sql Server reporting service, and also to configure it to native mode. 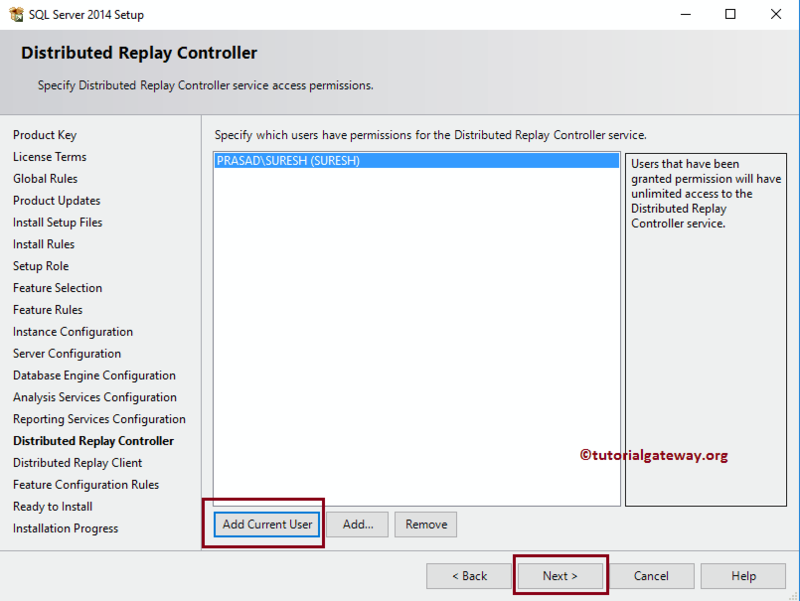 STEP 15: Within the Distributed Replay Client page, you have to specify the Controller Machine name that you are going to use as reply client. 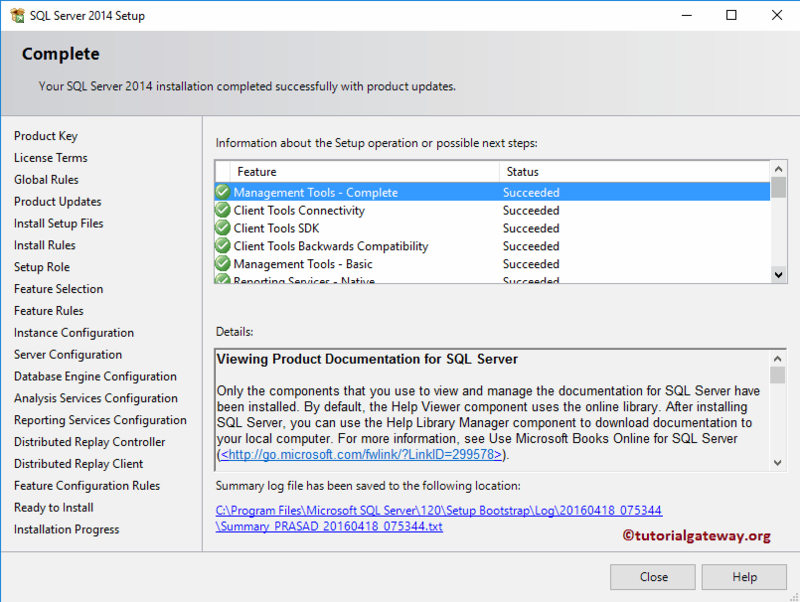 STEP 18: Before closing the SQL Server Setup Wizard, please check the status of each feature. If they are successful then you are good to go.